I’m currently undertaking a part-time PhD in the History Department at the Open University funded through CHASE (The Consortium for Humanities and Arts in the South East). My interests lie in museums of profession – for example collections gathered by the emergency services, the clothing or mining industries, medical or educational institutions – the relationships between organisational culture and heritage; police historic collections and archives; the policies around the retention and destruction of organisational records; professional souvenir-keeping; documents versus artefacts and forms of information; document life-cycles; material culture and artefacts as intermediaries. With many years experience of working for museums and art galleries, both employed and freelance, my work has become intrinsically linked to my research and I am always interested in exploring opportunities which bring the two together. 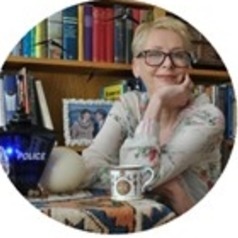 I am also an Arts Council England museum mentor, currently supporting Tetbury Police Museum, and a committee member of the Arts Council England Specialist Subject Network Group – The Crime and Punishment Collections Network (CaP).